We describe here a system utilizing a site-specific, reversible in vivo protein block to stall and collapse replication forks in Escherichia coli. 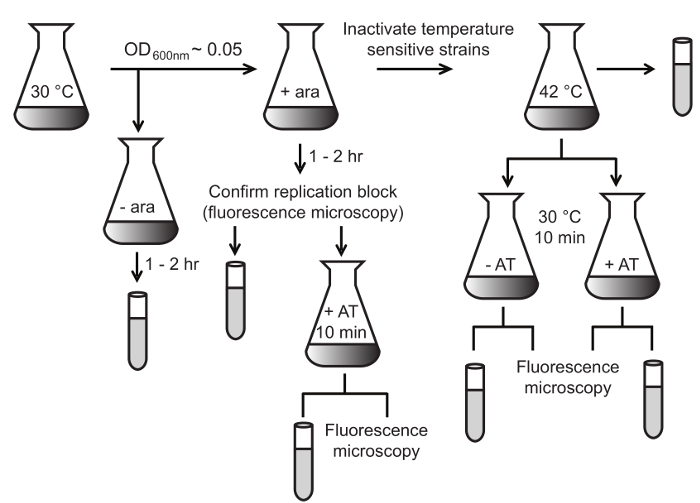 The establishment of the replication block is evaluated by fluorescence microscopy and neutral-neutral 2-dimensional agarose gel electrophoresis is used to visualize replication intermediates. Mettrick, K. A., Lawrence, N., Mason, C., Weaver, G. M., Corocher, T. A., Grainge, I. Inducing a Site Specific Replication Blockage in E. coli Using a Fluorescent Repressor Operator System. J. Vis. Exp. (114), e54434, doi:10.3791/54434 (2016). Obstacles present on DNA, including tightly-bound proteins and various lesions, can severely inhibit the progression of the cell's replication machinery. The stalling of a replisome can lead to its dissociation from the chromosome, either in part or its entirety, leading to the collapse of the replication fork. The recovery from this collapse is a necessity for the cell to accurately complete chromosomal duplication and subsequently divide. Therefore, when the collapse occurs, the cell has evolved diverse mechanisms that take place to restore the DNA fork and allow replication to be completed with high fidelity. Previously, these replication repair pathways in bacteria have been studied using UV damage, which has the disadvantage of not being localized to a known site. This manuscript describes a system utilizing a Fluorescence Repressor Operator System (FROS) to create a site-specific protein block that can induce the stalling and collapse of replication forks in Escherichia coli. Protocols detail how the status of replication can be visualized in single living cells using fluorescence microscopy and DNA replication intermediates can be analyzed by 2-dimensional agarose gel electrophoresis. Temperature sensitive mutants of replisome components (e.g. DnaBts) can be incorporated into the system to induce a synchronous collapse of the replication forks. Furthermore, the roles of the recombination proteins and helicases that are involved in these processes can be studied using genetic knockouts within this system. During DNA replication, the replisome faces obstacles on the DNA that impair its progression. DNA damage including lesions and gaps as well as aberrant structures can prevent the replisome from proceeding1. Recently, it has been found that proteins bound to the DNA are the most common source of impediment to replication fork progression2. The knowledge of the events following the encounter of the replisome with a nucleoprotein block has previously been limited by the inability to induce such a block in the chromosome of a living cell at a known location. In vitro analysis has enhanced our understanding of the kinetic behavior of an active replisome when it meets a nucleoprotein blockage3, as well as the mechanistic details of the replisome itself4,5. Current understanding of the repair of replication is generally undertaken with UV as the damaging agent and studied using plasmid DNA in vivo6-8. While the proteins that may be involved in repair of DNA after it encounters an in vivo nucleoprotein block are generally understood from these studies, whether there are variations in the molecular events within the repair pathways owing to the distinct cause in the replication block is still yet to be determined. Here, we describe a system that allows a nucleoprotein block to be established in a specific location of the chromosome using a Fluorescent Repressor Operator System (FROS). We utilize a strain of E. coli that has had an array of 240 tetO sites incorporated into the chromosome9. Each tetO site within the array has a 10 bp random sequence flanking it to increase the stability of the array by preventing RecA-mediated recombination within the array. This array, and variations of it, were originally used to understand E. coli chromosome dynamics10,11 but were then adapted to prevent in vivo replication12. The array has been found to be stably maintained and to block close to 100% of replication forks when bound by TetR10,12. The use of the similar lacO array in vitro has found as few as 22 sites were sufficient to block 90% of replication, although this shorter array was less effective in vivo13. To adapt the array to create a nucleoprotein blockage, the repressor protein must be highly overproduced under optimized conditions where it then binds to the array to create a roadblock. The formation of the blockage, and its subsequent release, can be monitored through the use of fluorescence microscopy if a fluorescently tagged variant of the Tet repressor is used. The status of replication in each cell is indicated by the number of foci seen, where a single focal point means only one copy of the array is present within the cell and multiple foci are indicative of active replication. This active replication is enabled when the nucleoprotein blockage is reversed by the addition of the gratuitous inducer that decreases the binding affinity of TetR for the operator site sufficiently for the replisome to proceed through the array. The repressor protein is still able to bind to the DNA with high enough affinity that the now multiple copies of the array can be visualized. More intricate details of the events at the nucleoprotein blockage can be discovered using neutral-neutral two-dimensional agarose gel electrophoresis and Southern hybridization14-16. These techniques allow the analysis of DNA structures across the population. The replication intermediates that are formed during the event, and potentially remain unrepaired, can be visualized. By varying the restriction enzyme and probe utilized, the intermediates can be visualized not only in the array region but also upstream of the array when the replication fork regresses17,18. The regression takes place subsequent to the replisome dissociation; the leading and lagging nascent strands separate from the template strands and anneal to each other as the template strands concurrently re-anneal resulting in a four-way DNA structure (a Holliday junction). Using this system it has been shown that the replication fork is not stable when it encounters this block18. In addition, temperature sensitive derivatives of replisome components can be utilized to prevent reloading of the replication fork once it has collapsed. Once a block is established, the strain can be shifted to a non-permissive temperature to ensure a synchronous deactivation of the replisome and a controlled prevention of reloading. This temperature-induced deactivation ensures all of the forks within the population have collapsed at a given time and allows the assessment of what happens when the replisome collapses, how the DNA is processed, and what is required to restart the process of DNA replication. An advantage of the system described here is that the nucleoprotein block is fully reversible; therefore, the ability of the cells to recover from the nucleoprotein block is able to be followed. The addition of anhydrotetracycline to the cells will relieve the tight binding of the repressor, allowing a replication fork to proceed through and the cell to regain viability. The relief of the blockage can be visualized by neutral-neutral two-dimensional agarose gel electrophoresis after 5 min, and by microscopy within 10 min. Furthermore, viability analysis can reveal the ability of the strain to recover from the replication blockage and continue to proliferate. By altering the genetic background of the strains used in the experimental procedure described here, the repair pathways for this type of blockage can be elucidated. Dilute a fresh overnight culture of an E. coli strain carrying a tetO array and pKM118 to OD600nm = 0.01 in a dilute complex medium (0.1% tryptone, 0.05% yeast extract, 0.1% NaCl, 0.17 M KH2PO4, 0.72 M K2HPO4) with antibiotics as required for selection. Note: Do not add tetracycline for selection as it is not compatible with this system. Make the volume of the culture equivalent to 10 ml per sample required. For example, the culture volume for the experimental design in Figure 1 is 60 ml. Grow at 30 °C with shaking until OD600 nm = 0.05-0.1. Remove a 10 ml sample to serve as the uninduced control and add 0.1% arabinose to the remaining culture to induce the production of TetR-YFP from pKM1. Continue to grow both the uninduced and induced cultures. After 1 hr, check for the presence of a single focal point within each cell of the induced culture using fluorescence microscopy (see section 2). If the induced cells are confirmed blocked (more than 70% of cells have a single focus), record the OD600nm and take a 7.5 ml sample for analysis by 2-D gels (see section 3). Take an equivalent sample from the uninduced control culture. To release the replication block, add 100 ng ml-1 of the gratuitous inducer anhydrotetracycline (AT) to a 10 ml sample of the blocked cells. Continue to grow at 30 °C for 10 min and take samples for cell density (1 ml), microscopy analysis (10 µl) and neutral-neutral 2-dimensional agarose gels (7.5 ml). If the cells contain a temperature sensitive allele such as dnaBts or dnaCts that requires deactivation, move the flask containing the blocked cells to 42 °C. Take samples for analysis at time points required (e.g., 1 hr after incubation). After the cells have incubated at 42 °C for 1 hr, shift the cells to 30 °C for 10 min (see Figure 1). Note: The cells can be shifted to 30 °C for restart analysis. Figure 1: Overview of the FROS Replication Block and Release Experimental Procedure. E. coli strains carrying the tetO array are grown at 30 °C. 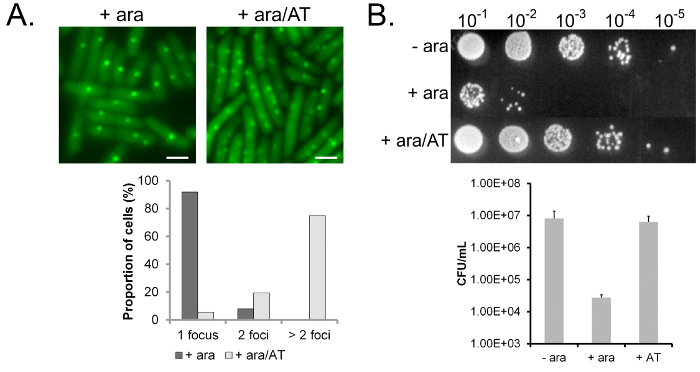 When the cells reach an OD600nm of above 0.05, TetR-YFP production is induced with arabinose (ara; 0.1%). Continue to grow a subpopulation of uninduced cells to act as controls at 30 °C. A sample of the induced cells is analyzed via fluorescence microscopy after 1 - 2 hr (see 2.1). If replication is confirmed to be blocked, samples are taken for 2-D gel analysis indicated by the test tubes (see 3.1) and for viability tests (optional). The replication blockage can be removed with anhydrotetracycline (AT; 0.1 µg/ml) and cells analyzed 10 min later. If cells carry a temperature sensitive allele (e.g. dnaBts), this can be inactivated by shifting the blocked cells to 42 °C for appropriate analysis. Please click here to view a larger version of this figure. Prepare an agarose pad by pipetting 500 µl of molten agarose (1% in water) onto a microscope slide; overlay the coverslip immediately before the agarose solidifies. Store the slide(s) in wet tissues at 4 °C until needed. When the agarose has solidified, remove the coverslip from the agarose pad and pipette 10 µl of bacterial culture onto the center of the pad to prevent movement of the cells during visualization. Once the sample has dried (approximately 5 min), replace the coverslip. Place a drop of immersion oil onto the cover slip and place the slide under optics. Visualize the Cells Using Phase Microscopy at 100X Magnification. On the Acquire dialog box within the imaging software, set exposure time to 100 msec. Capture the image by selecting Acquire. Do not move the stage. In the Acquire dialog box, select YFP as the illumination for the External Shutter Linked to Camera. Set the exporsure time to 1,000 msec. Turn off the stage light. Capture the fluorescence image by selecting Acquire. Note: Time may vary depending upon light source, microscope and camera used. To overlay the phase and fluorescent images, select Color Combine from within the Display menu. In the Color Combine dialog box, select the YFP image as the green component and the phase image as the blue component. Click on color combine. Determine whether the population has had replication successfully blocked by establishing whether the majority of the cells have one focus per cell. Note: Comparison to a sample from the control without added arabinose is useful to visually identify the difference in eYFP production. Add sodium azide (final concentration of 0.1%) to the 7.5 ml culture samples from steps 1.1.3 and 1.2.1. Incubate on ice for at least 5 min. Note: Sodium azide is extremely toxic. Consult the Safety Data Sheet prior to commencing work and do not handle it until all safety precautions have been read and understood. Centrifuge the cells 5,000 x g for 10 min to pellet cells. Discard the supernatant and resuspend the pellet in 200 µl of Pett IV (PIV) buffer (10 mM Tris:HCl (pH 8.0), 1 M NaCl). Microcentrifuge (13, 000 x g for 2 min) to pellet cells. Discard the supernatant. At this stage, the process the pellets further or store at -20 °C. Resuspend the cells with the lowest cell density in 50 µl PIV and place at 50 °C. For all other samples, adjust the volumes of PIV so the final cell density is the same in each tube (e.g. Sample 1 (OD600nm = 0.128) resuspended in 50 µl; Sample 2 (OD600nm = 0.138) resuspended in 54 µl). Add an equal volume of freshly prepared 0.8% agarose solution in PIV (final conc. 0.4%; e.g. Sample 1 50 µl, Sample 2 54 µl). Ensure that the samples, agarose and PIV are above 50 °C to prevent solidification. Treat a microscope slide with 40 µl of an appropriate glass water-repellent or silicone solution. Rub the slide with a tissue until it is dry. Note: This may be done in advance and the treated slides stored long term at room temperature. Place 20 µl drops of the cell/agarose suspension on the slide to produce plugs that are hemispherical. Note: The first sample (resuspended in 50 µl PIV) will produce 5 plugs on one slide. When the plugs have solidified, slide them gently into a microfuge tube and add 1 ml cell lysis buffer (10 mM Tris-HCl [pH 8], 1 M NaCl, 100 mM Ethylenediaminetetraacetic acid (EDTA), 0.2% sodium deoxycholate, 0.5% N-Lauroylsarcosine sodium salt (Sarkosyl), 100 µg ml−1 lysozyme, 50 µg ml−1 RNase A). Incubate at 37 °C for 2 hr. Remove the cell lysis buffer and add 1 ml EDTA/Sarcosyl/Proteinase K (ESP) solution (0.5 M EDTA, 1% N-Lauroylsarcosine sodium salt (Sarkosyl), 1 mg ml−1 proteinase K). Incubate at 50 °C overnight or until the plugs are transparent. If a second overnight incubation is required, replace the ESP solution with fresh buffer after approximately 18 hr. Remove the ESP buffer and wash the plugs 5 times with 12 ml Tris-EDTA (TE) buffer (10 mM Tris-HCl, 1 mM EDTA, pH 8.0), allowing a 30 min equilibration with each wash. Store at 4 °C in 1 ml TE buffer. Transfer an agarose plug from step 3.8 to a fresh microfuge tube and add 150 µl of restriction enzyme buffer (1x concentration). Add 25-100 units of restriction enzyme (e.g., 60 units of EcoRV; (see Figure 3A)). Digest at 37 °C for 6-8 hr. At 4 °C, pour a 0.4% agarose gel (300 ml) in 1x Tris/Borate/EDTA (TBE) into a gel tray of approximately 25 x 25 cm. Insert a comb to make wells approximately the same width as the diameter of the plug. When the gel is set, remove the comb and move the gel to room temperature. Slide one of the digested agarose plugs into a well, positioning the flat slide of the plug against the side of the well where the DNA will enter the gel. Insert a single plug in the same manner into every second well. Pipette molten 0.4% agarose into the wells to seal the plugs in position. Load 1 kb DNA ladder in an empty well, again leaving a gap between the ladder and samples, and run the gel overnight (16 hr, 55 V) in 1x TBE at room temperature. Stain the gel in a water bath containing ethidium bromide (0.3 µg ml-1) for 20 min. Note: Ethidium bromide is considered a potent mutagen and a toxin. Consult the Safety Data Sheet prior to commencing work and do not handle it until all safety precautions have been read and understood. Visualize the DNA with a long-wave UV transilluminator and cut out each lane fragment with a straight, even cut, minimizing the inclusion of excess agarose on either side of the lane. Note: For example, if the fragment of interest is 5.5 kb, cut a 7.5 cm fragment to include the DNA fragments from 5 kb to approximately 12 kb (see Figure 3A). Place the excised gel lane in a gel tray at 90° to direction of DNA migration. Note: Two rows of 3 gel fragments can fit in a 25 x 252 cm gel tray. The first row of gel lanes is at the top of the tray, the second row at 12.5 cm. Prepare 300 ml agarose for the second dimension gel (0.9% in 1x TBE with 0.3 µg ml-1 ethidium bromide). When the agarose is cooled to 50 °C, pipette the molten agarose around the gel slices to solidify their position. Pour the remaining agarose into the tray to a depth that is at least level with the gel slices. Once the gel is solidified, electrophorese at 4 °C in 1x TBE containing 0.3 µg ml-1 ethidium bromide at 220 V until the DNA has migrated approximately 10 cm. Note: 4 hr is sufficient for a 5.5 kb fragment but a smaller fragment will need less time. Excise the blocks where the genomic DNA is present using the edge of a metal ruler, including the gel above it to include the DNA that is not visible (see Figure 3C). Prepare Depurination buffer (0.125 M HCl solution). Note: This buffer can be reused and is stable at room temperature for up to 1 month. Prepare Denaturation buffer (1.5 M NaCl, 0.5 M NaOH). Note: Denaturation buffer can be reused once and is stable for up to 3 months at room temperature. Prepare Neutralization buffer (1.5 M NaCl, 0.5 M Tris). Adjust to pH 7.5 with HCl. Note: Neutralization buffer can be reused once and is stable for up to 3 months at room temperature. Prepare 10x Saline Sodium Citrate (SSC) buffer (0.15 M Tri-sodium citrate, 1.5 M NaCl, pH is 7 - 8) for use in steps 5.2.4 and 5.2.6. From this buffer, make a 2x SSC stock (for use in step 5.2.9). Note: 10x SSC and 2x SSC are stable at RT for 3 months. Prepare Modified Church and Gilbert Hybridization Buffer19 (0.5 M phosphate buffer [pH 7.2], 7% (w/v) sodium dodecyl sulfate (SDS), 10 mM EDTA). Leave at 65 °C to dissolve thoroughly prior to use. Rinse the excised gel blocks in depurination solution for 10 min at RT on a rocker or orbital shaker. Keep the agitation speed low to avoid damaging the agarose blocks. Rinse the gel blocks briefly with distilled water and then with denaturation buffer for 30 min. Rinse again briefly in distilled water and then incubate the gel blocks in neutralization buffer for 30 min with gentle agitation at room temperature. Cut a nylon membrane to the exact size of the gel(s). Cut a nick in the top right hand corner to assist in orienting the membrane in future steps. Note: Two gel blocks (6 samples) can be visualized on one membrane. Pour enough 10x SSC into a tray so that it will not dry out overnight. Create a platform approximately 5 cm above the level of the buffer. Saturate 3 sheets of 3MM chromatography paper with 10x SSC and place on the platform. Cut the chromatography paper so that it is long enough to be immersed in buffer at both ends and wide enough to fit the membrane gel on. Place the gel(s) on top of the saturated chromatography paper. Frame the gel with plastic wrap to prevent the buffer by-passing the gel during transfer. Carefully lay the cut membrane on top of the gel(s). Remove air bubbles between the membrane and gel by rolling a bottle or serological pipette gently across the membrane. Cut three sheets of 3MM chromatography paper to the same size as the membrane. Saturate the chromatography paper sheets with 10x SSC and place on top of the membrane. Remove any air bubbles that have formed. Stack paper towels at least 5 cm high on top of the blotting paper followed by a solid support (approximate weight of 1 kg for a 23 x 16 cm membrane). Allow the transfer to proceed overnight. Expose the membrane (DNA side up) to 1,200 J/m2 of UV to crosslink the DNA to the membrane. Do not rinse prior to this step. Rinse the membrane thoroughly in 2x SSC to prevent high background on the blot images. Use the blot immediately for hybridization (see 5.3) or dry it at RT, wrap in plastic wrap and store at 4 °C. Preheat hybridization oven and bottles to 55 °C. Add 100 µg ml-1 bovine serum albumin (BSA) and 10 µg ml-1 non-specific DNA (e.g. salmon sperm DNA) to the pre-warmed hybridization buffer. To allow for even coverage of the hybridization buffer when the membrane is rolled up, place the blot onto a similarly sized square of nylon mesh with the DNA-bound side of the membrane facing upwards. Roll the blot along its long edge. Slide the blot/mesh inside a hybridization bottle. Add an appropriate amount of pre-heated hybridization buffer to unroll the blot (e.g. 30 ml for a 23 x 16 cm2 membrane). Incubate in a pre-heated oven, rotating the bottles, for 1 hr. Prepare the probe by mixing 50 ng of purified PCR product homologous to the region of interest, 150 ng of random hexamer primers, buffer for Klenow fragment and H2O to make a volume of 13 µl. Boil for 3 min then place immediately onto ice. Add 1 µl of 1 mM dCTP/dGTP/dTTP mix, 1 µl of Klenow fragment (5U) and 50 µCi deoxyadenosine 5'-triphosphate radiolabeled on the alpha phosphate-(α32P-dATP). Incubate at room temp for 1 hr. Add 1 µl of 1 mM dNTP mix and 1 µl of Klenow fragment. Incubate 20 min at RT. Boil probe for 5 min and add immediately to hybridization tubes. Hybridize overnight at 55 °C, with rotation. Decant the probe from membrane. Note: The probe is able to be reused once. Rinse the membrane briefly in pre-warmed, low stringency wash buffer (2x SSC, 0.1% (w/v) SDS). Add fresh low stringency wash buffer and incubate for 5 min at 55 °C with rotation. Repeat. Wash twice in medium stringency wash buffer (1x SSC, 0.1% (w/v) SDS) for 10 min at 55 °C with rotation. Wash twice in high stringency wash buffer (0.1x SSC, 0.1% (w/v) SDS) for 5 min at 55 °C with rotation. Remove the membrane and dab with tissue to remove excess liquid. Wrap in plastic wrap ensuring there is no remaining moisture on the plastic wrap and place in exposure cassette with a pre-blanked storage phosphor screen. Close the cassette and expose for at least 2 hr before visualization using a phosphor imager. The FROS is an inducible, site-specific nucleoprotein block that enables replication intermediates to be visualized in living cells12,18. A general experimental design for sampling cells is illustrated in Figure 1. The timing of the sampling and variations in genetic background make this a versatile system for studying the repair of such a block. The schematic illustrates how temperature sensitive mutants, such as dnaBts and dnaCts that have been used previously18, can be utilized in this system. The induction of the FROS was carried out in an E. coli strain as shown in Figure 1 for non-temperature sensitive strains. To confirm that a nucleoprotein block had been established, cells were visualized using fluorescence microscopy after 1 hr of growth in 0.1% arabinose. This timeframe is usually adequate to produce the block in a wild type strain but more fastidious strains may require optimization. The majority of the cells contained 1 focus (Figure 2A, + ara), corresponding to only one copy of the array within the cell thereby indicating replication had been blocked. The numbers of cells with 1 focus, 2 foci or more than 2 foci were counted in a population of more than 100 cells. 92% of cells were found to have 1 focus with the remaining 8% with 2 foci. It was presumed that cells that had two foci spaced well apart, representing two copies of the array, would have the next round of replication blocked. Cells with two foci close together signify that the array has recently been replicated and the nucleoprotein block has not yet been achieved. The nucleoprotein block was reversed by the addition of anhydrotetracycline (AT) and subsequent duplication of the array visualized as the accumulation of cells with multiple foci (Figure 2A, + ara/AT). Multiple foci within a cell visualized by fluorescence microcopy signify the array has been successfully replicated and sufficient time has passed to allow the loci to move apart, overcoming any sister chromosome cohesion that was present. In this instance, 10 minutes after the addition of AT, 94% of cells had 2 or more foci and up to 8 foci per cell were visualized. To ensure that the nucleoprotein block did indeed inhibit replication, cell viability was analyzed (Figure 2B). Cells that have had replication inhibited by the FROS show an approximately 1000 fold decrease in colony forming units compared to cells that were not grown in the presence of arabinose. Cells that were subsequently grown in the presence of anhydrotetracycline show reversal of this growth inhibition. If the cells were unable to repair the DNA after release of the nucleoprotein blockage, a reduction in viability would result. To visualize the replication intermediates, cells can be lysed within agarose plugs and the protein and RNA removed. The DNA can then be digested with an appropriate restriction enzyme for the region of interest. DNA pictured in Figure 3A was digested with EcoRV which cuts the DNA immediately before the array, within the array and after the array to give 5.5 kb and 6.7 kb fragments in the region of interest (Figure 3B). Fragments are ideally ~3-7 kb for the protocol described here. Fragments outside this range may require alteration of the agarose concentrations used and the electrophoresis conditions to achieve good separation. The DNA was electrophoresed in the first dimension and visualized (Figure 3A). If the DNA has digested completely, all lanes will have run evenly and there will be a high amount of low molecular weight (less than approximately 3 kb, depending on the restriction enzyme). DNA present in the well suggests incomplete cell lysis and a lot of high molecular weight DNA (above 10 kb) implies incomplete DNA digestion. The DNA of interest in each lane was excised. In Figure 3A, DNA above 5 kb was included. The subsequent second dimension of the gel was electrophoresed, resulting in a diagonal of linear DNA (Figure 3C). The array DNA within this gel was then visualized by Southern hybridization (Figure 3D). In the unblocked (- ara sample), two spots can be seen, corresponding to the 5.5 kb and 6.7 kb fragments of the array, as expected. The sample which had replication blocked (+ ara) showed a decrease in the 5.5 kb spot in comparison and the addition of an elliptical signal, indicating an accumulation of Y-shaped DNA in the sample. The signal is localized to one position, signifying the replication forks are arresting in a similar place throughout the population. On addition of anhydrotetracyline, the Y-shaped DNA signal can no longer be seen. A recent restart is indicated by the presence of a signal of the entire Y-arc, depicting the forks migrating through the region. It is important to normalize the DNA within each agarose plug to ensure the signals of the samples are even. The signals can be quantified with appropriate imaging software. Another common intermediate seen is that indicating Holliday junction (HJ) formation. A HJ is visualized as a cone signal at the top of the Y-arc and a spike from the linear DNA at the end of the Y arc (Figure 3D). Figure 2: Fluorescence Microscopy and Viability. (A) An E. coli strain carrying the tetO array was grown at 30 °C in the presence of 0.1% arabinose (+ ara) for 1 hr and then anhydrotetracycline (AT) was added for 10 min to a subpopulation to release the replication block. Representative micrographs are shown for YFP production (top panel). Scale bar = 2 µm. The proportion of cells carrying 1, 2 or more than 2 foci were enumerated and are presented as a percentage (lower panel). (B) Cells grown in the absence of arabinose (- ara), with arabinose (+ ara) and with both arabinose and anhydrotetracycline (AT; 10 min) were serial diluted 10-fold and either spotted or spread onto agar containing ampicillin only (-/+ ara samples) or ampicillin with anhydrotetracycline (+ AT sample) and grown at 30 °C to determine cell viability. Top: representative plate showing growth at indicated dilutions. Bottom: graph showing the average CFU/ml +/- SEM. Please click here to view a larger version of this figure. Figure 3: Visualization of DNA Replication Intermediates at a Nucleoprotein Block. (A) Genomic DNA from cells (1, - ara; 2, + ara; 3, + ara/AT) that were lysed within agarose plugs and digested with EcoRV restriction enzyme was separated on a 0.4% agarose gel (55 V, 16 hr). 3 kb, 5 kb and 10 kb bands are indicated. The DNA above the 5 kb marker was excised as indicated by the white boxes. (B) Schematic of the EcoRV digest of the array region. 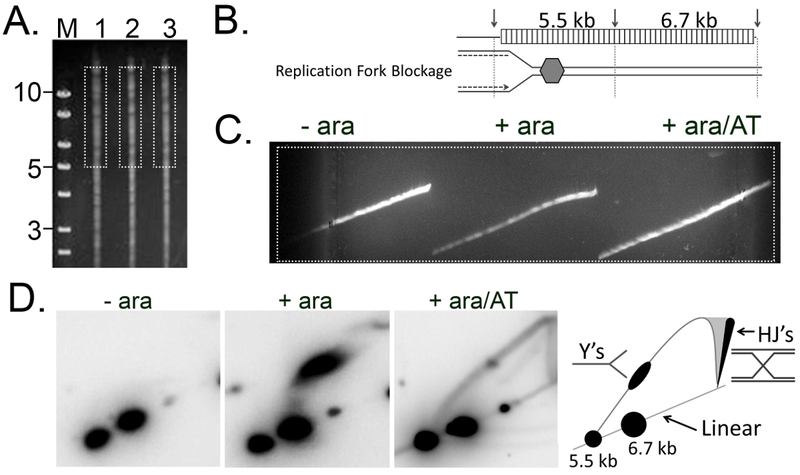 Replication forks entering the array from the origin become blocked within the 5.5 kb fragment when the cells have been grown in the presence of arabinose. Restriction sites utilized are indicated by arrows and the array is shown as a box with lines. (C) The excised DNA was rotated 90° and separated in a 0.8% agarose gel (220 V, 4 hr). The white box indicates the excision of DNA after separation. (D) The array region was subsequently visualized by Southern blot analysis using a radioactive probe to the array region. Cells with a replication block at this position will have the signal corresponding to the 5.5 kb fragment located on the Y-arc. Please click here to view a larger version of this figure. During chromosome duplication, the replication machinery will encounter various impediments that prevent its progress. To ensure the entire single-origin chromosome is replicated, bacteria have numerous pathways for repair of the DNA that then enables the replisome to be reloaded20,21. Lesions, single stranded breaks, double stranded breaks and proteins tightly bound to the DNA may each be dealt with using a dedicated pathway, although there is likely to be significant overlap in these pathways. The most common impediment to replisomes in living cells is a nucleoprotein block2. However, two longstanding difficulties in studying the collision of a replisome with a nucleoprotein blockage have been how to localize the event to a known position on the chromosome and how to make the event frequent enough to allow detailed analysis. The majority of the knowledge of how E. coli copes with stalled/collapsed replication forks comes from the use of UV as a DNA damaging agent. The FROS protocol described here is a novel way of creating a site-specific nucleoprotein roadblock, similar to what the replisome will meet when it encounters proteins tightly bound to the chromosome during replication. The induced blockage and controlled release of this block allows the stages of DNA processing to be studied in discrete steps. The array of tetO sites used to block replication has previously been utilized to visualize chromosome organization9,10. While the array can be placed anywhere in the chromosome, for the purpose of the array described here, it should be distant from both the origin and the terminus to avoid complications in interpreting the signals observed from second rounds of initiation at the origin or from the replication fork proceeding around the opposite replichore. By optimizing the overproduction of TetR with the use of the dilute complex medium (protocol 1), we have found that sufficient TetR is produced to create a complete replication blockage that is stably maintained, while limiting the number of new rounds of replication that are initiated. The incorporation of replisome temperature sensitive mutations22 into the system ensures all replisomes are deactivated simultaneously and uncontrolled replisome reloading is prevented. Whilst the number of foci per cell are useful for knowing the cell's replication status, the most enlightening data for DNA repair is from the analysis of the replication intermediates revealed by 2-D gel electrophoresis during an active replication blockage. Analysis of different genetic backgrounds can identify proteins involved in processing and restart of collapsed replication forks by the different patterns observed following the 2-D gel protocol. Further, intermediates from the processing of collapsed replication forks can be present at the array region or in the DNA upstream of the array, and can be visualized using 2-D gel electrophoresis. Creating duplicate agarose plugs (Protocol 3) has the advantage of allowing for digestion of the same sample with different restriction enzymes to be able to visualize replication intermediates in successive DNA regions. Therefore, the array region should be located in a position where appropriate restriction enzymes can be used to probe these regions of interest using Southern hybridization. The most common reasons that this technique may be unsuccessful are having either too little DNA which produces faint signals compared to background, or incomplete digestion of the DNA within the plugs. This can be caused by having too much DNA in the agarose plugs or the carry-over of some inhibitor from the lysis/washing steps. The number of cells taken for lysis within the agarose plugs may need to be varied from the protocol described here if modifications such as growth media are changed. However, it is futile to continue with the hybridization if the DNA in the plugs has not digested to completion. A repeat treatment of ESP may be required to better prepare the DNA (protocol 3.6). If the replication intermediates that are of interest are only transient, or are particularly rare within the cell, the DNA sample may need to be enriched for them, for example with the use of BND-cellulose which will bind short stretches of single stranded DNA, such as those found in replicating chromosomes23. Stabilization of replication intermediates by crosslinking with psoralen has also been used as a method of preserving DNA integrity24. When the intermediates are rare, it is important to optimize the probe and blocking of the membrane to prevent background signals from interfering. On completion of the blots the signals may be quantified with appropriate image processing software. The protocol described here is an optimized system for creating a site-specific nucleoprotein blockage and analyzing replication intermediates when the replisome is unable to proceed through the blockage. With the establishment and optimization of this technique, the roles of various helicases and recombination proteins in processing the replication fork and in allowing the restart of replication can be identified. By varying the genetic background, the effect of the absence of these proteins can be analyzed. However, this technique is limited by requiring not only viable strains but strains that are also able to overproduce TetR at a rate that will create a stable nucleoprotein blockage. This work was supported by the Australian Research Council [DP11010246]. Ethylene diaminetetraacetic acid Ajax Finechem AJA180 0.5 M EDTA disodium salt solution adjusted to pH 8.0 with NaOH. Mirkin, E. V., Mirkin, S. M. Replication fork stalling at natural impediments. Microbiol Mol Biol Rev. 71, (1), 13-35 (2007). Gupta, M. K., et al. Protein-DNA complexes are the primary sources of replication fork pausing in Escherichia coli. Proc Natl Acad Sci U S A. 110, (18), 7252-7257 (2013). McGlynn, P., Guy, C. P. Replication forks blocked by protein-DNA complexes have limited stability in vitro. J Mol Biol. 381, (2), 249-255 (2008). Tanner, N. A., et al. Single-molecule studies of fork dynamics in Escherichia coli DNA replication. Nat Struct Mol Biol. 15, (2), 170-176 (2008). Hamdan, S. M., Loparo, J. J., Takahashi, M., Richardson, C. C., van Oijen, A. M. Dynamics of DNA replication loops reveal temporal control of lagging-strand synthesis. Nature. 457, (7227), 336-339 (2009). Rudolph, C. J., Upton, A. L., Lloyd, R. G. Replication fork stalling and cell cycle arrest in UV-irradiated Escherichia coli. Genes Dev. 21, (6), 668-681 (2007). Jeiranian, H. A., Courcelle, C. T., Courcelle, J. Inefficient replication reduces RecA-mediated repair of UV-damaged plasmids introduced into competent Escherichia coli. Plasmid. 68, (2), 113-124 (2012). Le Masson, M., Baharoglu, Z., Michel, B. ruvA and ruvB mutants specifically impaired for replication fork reversal. Mol Microbiol. 70, (2), 537-548 (2008). Wang, X., Liu, X., Possoz, C., Sherratt, D. J. The two Escherichia coli chromosome arms locate to separate cell halves. Genes Dev. 20, (13), 1727-1731 (2006). Lau, I. F., et al. Spatial and temporal organization of replicating Escherichia coli chromosomes. Mol Microbiol. 49, (3), 731-743 (2003). Gordon, G. S., et al. Chromosome and low copy plasmid segregation in E. coli: visual evidence for distinct mechanisms. Cell. 90, (6), 1113-1121 (1997). Possoz, C., Filipe, S. R., Grainge, I., Sherratt, D. J. Tracking of controlled Escherichia coli replication fork stalling and restart at repressor-bound DNA in vivo. EMBO J. 25, (11), 2596-2604 (2006). Payne, B. T., et al. Replication fork blockage by transcription factor-DNA complexes in Escherichia coli. Nucleic Acids Res. 34, (18), 5194-5202 (2006). Brewer, B. J., Fangman, W. L. The localization of replication origins on ARS plasmids in S. cerevisiae. Cell. 51, (3), 463-471 (1987). Jeiranian, H. A., Schalow, B. J., Courcelle, J. Visualization of UV-induced replication intermediates in E. coli using two-dimensional agarose-gel analysis. J Vis Exp. (46), (2010). Southern, E. M. Detection of specific sequences among DNA fragments separated by gel electrophoresis. J Mol Biol. 98, (3), 503-517 (1975). Courcelle, J., Donaldson, J. R., Chow, K. H., Courcelle, C. T. DNA damage-induced replication fork regression and processing in Escherichia coli. Science. 299, (5609), 1064-1067 (2003). Mettrick, K. A., Grainge, I. Stability of blocked replication forks in vivo. Nucleic Acids Res. (2015). Church, G. M., Gilbert, W. Genomic sequencing. Proc Natl Acad Sci U S A. 81, (7), 1991-1995 (1984). Michel, B., Grompone, G., Flores, M. J., Bidnenko, V. Multiple pathways process stalled replication forks. Proc Natl Acad Sci U S A. 101, (35), 12783-12788 (2004). Michel, B., Boubakri, H., Baharoglu, Z., LeMasson, M., Lestini, R. Recombination proteins and rescue of arrested replication forks. DNA Repair (Amst). 6, (7), 967-980 (2007). Carl, P. L. Escherichia coli mutants with temperature-sensitive synthesis of DNA. Mol Gen Genet. 109, (2), 107-122 (1970). Nawotka, K. A., Huberman, J. A. Two-dimensional gel electrophoretic method for mapping DNA replicons. Mol Cell Biol. 8, (4), 1408-1413 (1988). Cole, R. S., Levitan, D., Sinden, R. R. Removal of psoralen interstrand cross-links from DNA of Escherichia coli: mechanism and genetic control. J Mol Biol. 103, (1), 39-59 (1976).